In this chapter we are going to learn the difinition of a ‘circle’ and discuss about its general equation, its tangents and normals and various other properties like the power of a point, pole and polar with respect to a circle. Relative positions of two Circlces and thier common tangents. The locus of a point in a plane which moves in such a way that its distance from a fixed point in the plane is always a constant, is called a circle. If a= b = 0 (i.e. the centre of the circle is at origin) then equation of the circle reduce to x2 + y2 = r2. If r = 0 then the circle represents a point or a point circle. The equation x2 + y2 + 2gx + 2fy + c = 0 is the general equation of a circle with centre (–g, –f) and radius √(g2+f2-c). Equation of the circle with points P(x1, y1) and Q(x2, y2) as extremities of a diameter is (x – x1) (x – x2) + (y – y1)(y – y2) = 0. The equation of the chord AB. Equal chords of a circle subtend equal angles at the center. The angle subtended by an arc at the center id double the angle subtended by the same arc at the circumference of the circle. Angle between the tangent and the radius is 90°. Angle in a semi-circle is 90°. Two angles at the circumference subtended by the same arc are equal. The equation of the tangent on a point on the circle and the equations of chord of contact are both represented by T = 0. But the difference between the two is that in case of chord of contact, the point say (x1, y1) lies outside the circle while in case of tangent it lies on the circle. Common tangents may be either direct or transverse. Direct common tangents to two circles meet on the line joining the centers and hence divide it externally in the ratio of their radii. Transverse common tangents also meet on the line of centers as the direct common tangents but the difference being that they divide it internally in the ratio of their radii. There cannot be any common tangent if a circle lies completely inside another without touching it. If two circles touch each other internally one and only one common tangent is possible. If two circles touch each other in two distinct points, then in such a case, two common tangents can be drawn. In case of two circles touching each other externally, three common tangents can be drawn. Four common tangents are possible when two circles neither touch nor intersect but one lies completely inside the other. Internally: If |C1 C2| = |r2 – r1| and the point of contact is ((r1x2-r2x1)/(r1+r2) , (r1y2-r2y1)/(r1+r2)). Externally: If |C1 C2| = |r2 + r1| and the point of contact is ((r1x2+r2x1)/(r1+r2) , (r1y2+r2y1)/(r1+r2)). If the circles S = 0 and S’ = 0 intersect in real and distinct points, then S – S’ = 0 is the equation of the common chord of the two circles. If S’ = 0 and S = 0 touch each other, then S – S’ = 0 is the equation of the common tangent to the two circles at the point of contact. The radical axis of two circles is perpendicular to the line joining the centres. The radical axis of three circles taken two at a time are concurrent and the point of concurrency is known as the radical centre. The radical axis of two circles bisects their direct common tangents. If two circles cut a third circle orthogonally, then the radical axis of the two circles will pass through the centre of the third circle. S1 + λ S2 = 0 is the family of circles passing through the intersection of S1 = 0 and S2 = 0. The family of circles passing through the intersection of line L and circle S is given by S + λL = 0. A particular value of λ in the equation yields a unique circle. Number of common tangents = 0. Number of common tangents =1. Number of common tangents = 3. Number of common tangents = 2. Number of common tangents = 4. We begin by recapitulating the definition of a circle and the terminology used for circles. Throughout this module, all geometry is assumed to be within a fixed plane. A circle is the set of all points in the plane that are a fixed distance (the radius) from a fixed point (the centre). Any interval joining a point on the circle to the centre is called a radius. By the definition of a circle, any two radii have the same length. Notice that the word ‘radius’ is being used to refer both to these intervals and to the common length of these intervals. An interval joining two points on the circle is called a chord. A chord that passes through the centre is called a diameter. Since a diameter consists of two radii joined at their endpoints, every diameter has length equal to twice the radius. The word ‘diameter’ is use to refer both to these intervals and to their common length. 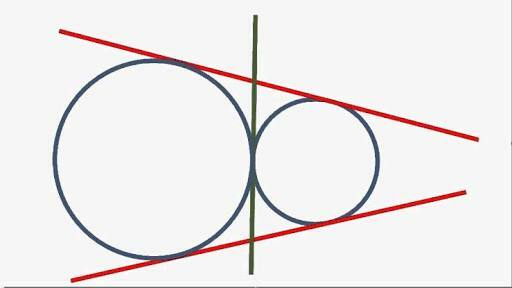 A line that cuts a circle at two distinct points is called a secant. Thus a chord is the interval that the circle cuts off a secant, and a diameter is the interval cut off by a secant passing through the centre of a ‘circle’.